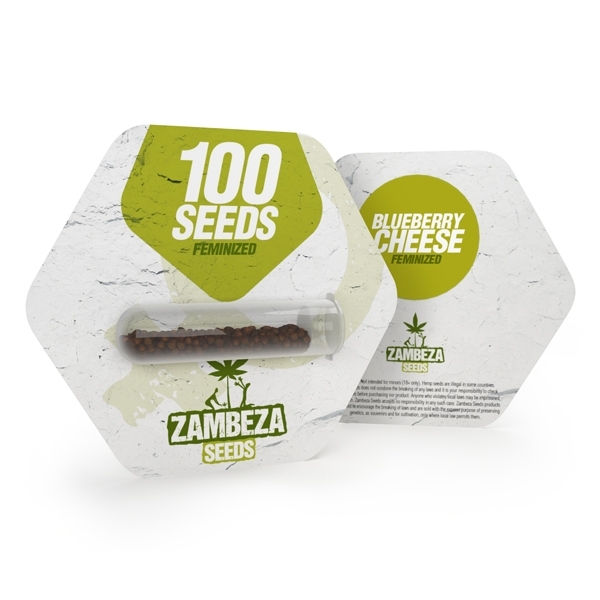 To create their Blueberry Cheese, Zambeza took two excellent strains: the productive White Cheese and the awesomely fruity Blueberry. Out comes an extraordinary indica dominant strain that shines with a superb aroma and a great happy high. Blueberry Cheese Bulk can be grown anywhere without a fuss and she’s especially well-suited for guerrilla grows due to her sturdiness. Blueberry by herself enjoys already huge popularity among cannabis connoisseurs because of her great berry flavour while White Cheese is one of these superb strains that impresses with fantastic production and potency. While these are just some of the qualities of these two stellar strains, it’s clear that a cross of the both would result into something awesome. Blueberry Cheese by Zambeza grows to a medium-sized plant that will likely reach 100-130cm when you grow her indoors. Outdoors, she can get a bit taller where she may grow to 150-200cm in ideal conditions. Because of her sturdiness, just the right size and the fact that she doesn’t really demand a lot, Blueberry Cheese can also be a perfect plant for guerrilla grows. If Blueberry Cheese gets plenty of sun outdoors, you can expect harvests of 400-500g per plant. Indoors, if you grow under a 600W light she can yield a very respectable 400-450g/m². Her flowering time is a reasonable 60 days. Zambeza managed it to combine the best of her two parents into a smoke with an awesome flavour profile. The superb Cheese taste with the spicy notes of the White Cheese meets the awesome fruitiness of the Blueberry, making for an incredible delightful smoke that you won’t want to put down once you take the first hit. But take it slow because, with her 18% of THC, Blueberry Cheese delivers a potent smoke with a very strong, deeply relaxing physical effect. With her awesome waves of deep relaxation comes a fantastic happy feeling that will make you smile and giggle endlessly! This makes Blueberry Cheese the perfect smoke that you can enjoy with a bunch of good friends if you want to chill, for watching movies or simply if you want to have some great fun time! Blueberry Cheese Bulk Seeds by Zambeza deliver everything that you’d expect from a first-class indica strain. Her excellent flavour, outstanding growing vigour, good resin production or her pleasant high make Blueberry Cheese Bulk a top choice among indica hybrids. Blueberry Cheese bulks seeds are available for growers in packs of 100 seeds.